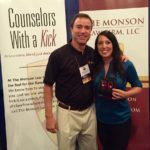 The Monson Law Firm sponsored a booth at the Louisiana Claims Association Conference earlier this week in Natchez, Mississippi. Congratulations to our door prize winner Brandi Seeger with LCI Workers’ Comp. We hope you enjoy your new Powerbeats2 Wireless Earbud Headphones. Thanks to everyone who stopped by our booth we look forward to seeing you again next year! Pictured are Matthew Monson, Esq. and Brandi Seeager. Click here to view pictures!